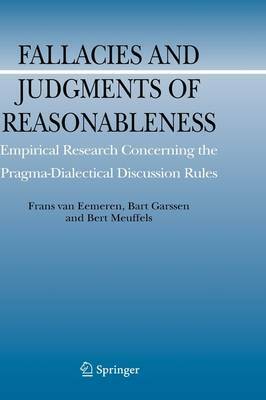 In Fallacies and Judgments of Reasonableness, Frans H. van Eemeren, Bart Garssen and Bert Meuffels report on their systematic empirical research of the conventional validity of the pragma-dialectical discussion rules. The experimental studies they carried out during more than ten years start from the pragma-dialectical theory of argumentation developed at the University of Amsterdam, their home university. In these studies they test methodically the intersubjective acceptability of the rules for critical discussion proposed in this theory by confronting ordinary arguers who have not received any special education in argumentation and fallacies with discussion fragments containing both fallacious and non-fallacious argumentative moves. The research covers a wide range of informal fallacies. In this way, the authors create a basis for comparing the theoretical reasonableness conception of pragma-dialectics with the norms for judging argumentative moves prevailing in argumentative practice. Fallacies and Judgments of Reasonableness provides a unique insight into the relationship between theoretical and practical conceptions of reasonableness, supported by extensive empirical material gained by means of sophisticated experimental research.